‘Performance’ is a ubiquitous term commandeered by and used in a range of academic disciplines and practical fields of human activity. It operates, more or less, as a semiotic tag within a set of conceptualisations that is part of a specific discipline and field of discourse, and functions as an epistemological frame within particular discursive practices. This tagging is discussed in six examples below, through the breadth of usage is far greater than is suggested in my exemplars. 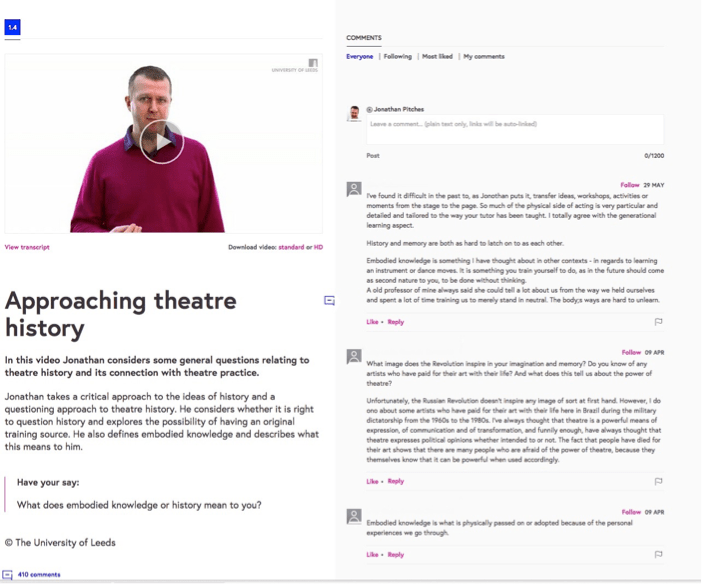 We must embrace the digital: Massive Open Online Courses as performer training tools. I’d like with my first ever blog entry to offer a challenge to the field of performer training. Let’s face it the current state of secondary drama education is in crisis. Much quoted figures include a drop of 23% in GCSE numbers in Drama from 2003-13, an 8% drop in Drama teachers in schools since 2010 and a 23% drop where an arts subject has been withdrawn. All of us will have anecdotal evidence from our colleagues of falling numbers at A Level and of systematic closures of (very successful) courses. How are we to arrest what many have called an ideological attack on the creative arts through changes to education? How are we to respond to the assessment of the Chair of the Warwick commission’s report on cultural value, that: “not enough is being done to stimulate or realise the creative potential of individuals, or to maximise their cultural and economic value to society. Improvement requires a greater degree of investment, participation, education and digital access’ (2015: 9)? Performer training will not survive in any guise of inclusiveness unless it diversifies its infrastructure and fully embraces the rise of digital culture. Let’s consider this statement by considering the development of Massive Open Online Course, and specifically, one I have recently run on Meyerhold’s Biomechanics. Time as it is constructed within the MOOC platform (e.g. FutureLearn). Time as it is designed by the educator (including the improvement of user engagement using learner analytics). Time as it experienced by the teacher during the MOOC. Time as it experienced by the participants during the MOOC, within and beyond the MOOC itself. Differing time zones of the participants. Differing ages, backgrounds and trainings of the participants. Time as it is experienced after the MOOC finishes. Time as historical content in the MOOC itself. For now, let’s focus on points 3-6. My own practice is influenced by laboratory traditions, informed by contemporary performance and ‘devising’ methods. I am working with an emergent performance ensemble using task-based methods of training and performance. An underlying dilemma that faces my practice is the process of taking work that has been formed in a closed environment into a wider and open context: making the private public. Within my own practice I have been, as a member of the ensemble, working in a closed environment for an extended period of time. Until we held a participatory work demonstration, open to the public to enter and interact with both us and our work. Within our closed environment we use objects such as paper, string and balloons. These objects are then utilised to create task-based fragments of performance, these tasks are detailed with complex and meticulous rules and sub-rules. One such task involved the use of homemade paper aeroplanes. When this task took place in the closed laboratory the ensemble became immersed in the task, following the rules and sub-rules. The ensemble were working interdependently, mutually dependent on each other to complete the overall task, whilst independently moving through their own stages of the task. During this task the ensemble demonstrated an intense and focused state, as their body(ies) repeatedly moved through the task concentrating on the task in the present moment. As a member of the ensemble, I was able to observe them loop though the repetition, continually throwing, aiming and repeating. However, when this task was demonstrated in the open environment the ensemble’s approach and method for completing the task shifted unexpectedly. It was noticeable that the ensemble were now individually driven to show their own skills, they were no longer moving through the task, they were performing rather than doing the task. Even breaking away from the task to explain the rules to the public, this direct interaction created a distinct division between the public and the ensemble and suggested that the rules and sub-rules had become fixed rather than remaining open. This highlights that when in the closed environment, for me, the focus is on the functional actions, enabling the focus of the task to be on doing. The emphasis in the closed laboratory is on the process not the product and the act of creating one singular participatory work demonstration resulted in the process becoming a product. In order to make the sharing of work part of the process, we might be led to believe that this sharing should not take place in one go but use multiple platforms for continual sharing, never fully closing the laboratory (door?). In 2013, an article that I wrote called Dark Voices in Revolt was published in the TDPT Journal (vol. 4(3), 2013, 360-380). The article discussed the application of existing Oriental and Occidental voice and movement methods (the term Physio-Vocal, to me, captures the exact essence of voice/movement integration practice and theory) in order to ‘discover’ an alternate to the multifaceted area of the voice in performance pertaining to the notion of ‘crisis’. Simply put, ‘crisis’ may be defined as an emotionally significant event (which possibly has negative connotations attached to it), an unstable situation, and so on. Throughout our investigations, training, performance practice and research, we came to the conclusion our work was categorised into three forms of ‘crisis’: physical crisis, conceptual crisis and vocal crisis. Physical crisis is a situation where the body is engaged in a challenging position, for example, it may be off balance in a moving or static state, moving dynamically through the space or placed in a position where the abdominal muscles are engaged to keep the body upright or in a stable position. Through these physical states, the performer must engage in various voice work. Conceptual crisis is a term (and practice) that is largely influenced by the philosophies and practice of Butoh dance, for example, exploring the illogical, absurd with the underpinning notion of ‘revolting’ against the convention. Of course, Butoh means one thing to one practitioner, and another thing to the other. It is not a method, which makes it quite difficult to pin down. Vocal crisis is a term given to when the use and semantics of the voice is extended, amplified, enlarged beyond recognition to depict the primordial, preverbal and representational significance of the inner contained energies expressed through sound. In my article ‘Dance training in Bali: intercultural and globalised encounters’ [5 ( 3), pp. 291-303] I discussed the changing approaches to the traditional world of Balinese topeng, which refers to the masked, dance –drama of Bali that is performed within a ceremonial context. (My short film gives a degree of context to the genre). In contrast to a purely ethnographic documentation of this training which the article fully details, I am pleased to have the opportunity to respond and ‘come back’ with a more personal and embodied perspective which centers on the challenges, obstacles and difficulties that I have faced in learning topeng and how I have overcome them by devising a more bespoke training suitable to my body, cultural understanding and abilities. Whilst I can technically ‘do it’ however much I can theoretically understand and appreciate the qualities of energy in the dance, as articulated by the Balinese, as a non-Balinese person I am unlikely to realise the potential of full embodiment and achieve something akin to taksu, the divine charisma that artists aspire to. On a less culturally ambitious level I am unlikely to achieve great success as I am following a training regime designed for a younger, nubile, pre-teen boy body which is somewhat difficult to follow. The challenge is to configure an appropriate training that can re-situate a specific performance technique within a wider intercultural analysis. This integrated training may enable a richer, deeper, more comfortable approach to dancing the traditional choreography of topeng. By seeking comfort in the gesture, being ‘in dialogue’ with the choreography means I can actively visualise the (dis)comfort, stop –pause- change and reassess as necessary. In this discussion of comfort, there is a paradox because Balinese dance is by nature difficult and virtuosity is the aim. Therefore comfort is never to be replaced or confused by making the gesture ‘easy’, however easefulness can be sought so that the dance ceases to be painful. Seeking comfort during training may compromise one’s gestural or expressive potential in performance, but it does promote actual enjoyment of the choreography, which in turn expels delight in the dance. I therefore experience on occasion what Fraleigh calls ‘intrinsic dance’ which she describes as a state of ‘pleasure we feel in our bodies when we are in our own flow of being, moving for the dance and not to please others’ (Fraleigh 2000: 58). Enjoyment and delight, is indicative and closer to the higher qualities of ceremonial performance as described by the various Balinese levels of attainment (Ruben and Sedana 2007: 125-126). This one, simple change in perspective has developed into a far more process driven approach to my topeng training which is based on somatics; and beyond the scope of what I have space to write here. All I can say is that this has enabled a shift from the Balinese pre-occupation with the spirit of the mask with a renewed interest into the potential ‘life force’ of my body. Fraleigh, Sondra. (2000) ‘Consciousness Matters’, Dance Research Journal, 32 (1), pp. 54 – 62. Rubin, Leon and Sedana, I Nyoman. (2007) Performance in Bali. Abingdon, New York: Routledge.